Emulated systems are currently Bally Astrocade, Casio PV-1000, coCo 1, 2 and 3, Emerson Arcadia 2001, Epoch Game Pocket Computer, Epoch Super Cassette Vision, Fairchild Channel F, Fujitsu FM-7, Fujitsu FM77-AV, Funtech Super A'Can, Hartung Game Master, Mattel Aquarius, Mega Duck, PC-6001, PC-6601, Philips CDi, Philips VG-5000, Sharp MZ-2500, Sharp X1, Socrates Educational Video System, Sord M5, Tatung Einstein and VTech Laser 200. Mores systems will be added in later releases. This is a Madmab and HCF co-production after years of work. We finally managed to port the MESS emulator to Xbox, so we finally have emulation for a lot of new systems. At the moment, we have added emulation for these ones: Bally Astrocade, Casio PV-1000, coCo 1, 2 and 3, Emerson Arcadia 2001, Epoch Game Pocket Computer, Epoch Super Cassette Vision, Fairchild Channel F, Fujitsu FM-7, Fujitsu FM77-AV, Funtech Super A'Can, Hartung Game Master, Mattel Aquarius, Mega Duck, PC-6001, PC-6601, Philips CDi, Philips VG-5000, Sharp MZ-2500, Sharp X1, Socrates Educational Video System, Sord M5, Tatung Einstein and VTech Laser 200. Mores systems will be added in later releases. When you launch the emulator you will see all the supported systems. Systems in green color can be usually played without keyboard, while systems in yellow color need to use a keyboard (real keyboard, or the virtual keyboard of the emulator). Each system has its own folder for the roms. For example, roms for the "Emerson Arcadia 2001" must be copied in the "roms/arcadia" folder. Please don't change the structure of the directories. There are generic controls, and specific controls for each system. Both can be configured. The most important keys are the A and WHITE buttons (they are normally used to Start a game and/or Action button), the START button (Main Menu) and the BACK button (exit/cancel). Pressing both triggers simultaneously activates the "Fast forward" (used to make load times shorter in some systems), and moving the right analog stick displays the virtual keyboard. Enjoy! The emulator works easily: simply launch the "default.xbe" and select the desired console/computer that you want to emulate. After that, you will see all the games for that system, and you can select the one that you want to play. If the emulator displays a message telling "press OK", simply move to left and right the left analog stick, and the game will begin. In the list of systems, you will see that some of them are green, and other systems are yellow. Yellow systems usually need a keyboard to play many games (you can use the Virtual Keyboard if you don't have a real keyboard plugged on your Xbox). Green systems should be easily controlled with a joypad. You must not change the directory structure, and you only need to know that there is an important folder named "roms". Inside of that folder, there is a subfolder for each system. For example, "roms/scv" is the folder for the "Super Cassette Vision", and "roms/cdimono1" is the folder for the Philips CDi. Do not change the names of these folders! Those subfolders inside "roms" contain both the BIOS files of the systems and the ROMS (games). So, if you have a game for the "Super Cassette Vision", you have to copy it in the "roms/scv" path (more subdirectories are not supported). MESS have some "Generic" controls (valid for all the systems) and also some "specific" controls for each system. You can configure them in the Main menu, but we have created good configurations for almost all the supported consoles and computers. In almost all the systems, you will be able to control the games with the left analog stick and with the dpad. The main buttons that you will use to start a game or for "action" are the A BUTTON or the WHITE BUTTON in almost all the supported systems, and BLACK button to select game modes. Anyways, the "README-SYSTEMS-DETAILED.TXT" file will have information about the way to use each system. * Y button: It toggles the keyboard emulation mode (usually you will not need to do this). * Left trigger: In systems with a keyboard, it is ENTER. * Right trigger: In systems with a keyboard, it is SPACE. Several systems support savestates. To save your state, press the right analog stick. A window will ask you to select the desired slot: press A to confirm, or BACK to cancel. To load your state, press the left analog stick. A window will ask you to select the desired slot: press A to confirm, or BACK to cancel. If you don't have a real keyboard, you can configure the controls and map the most used keys to the buttons of your joypad... but another alternative is using the Virtual Keyboard feature. The virtual keyboard is very useful when you only need to press a key once (for example, if a game says "press S to Start") and it is not worth it to map that key to one of the joypad buttons. The virtual keyboard is also useful to type commands (for example, to load games in the computer-based systems). The virtual keyboard is very basic, but I hope that it can help to play a lot of games. The original Mess didn't have a virtual keyboard, and including it has been a real challenge! How to launch the Virtual Keyboard? If you move the right analog stick, the emulation will be paused and the virtual keyboard will appear. You can select the key or keys that you want to press, selecting them with the A button. You can even type a text, pressing the keys one after the other! If you make a mistake, you can press on the Backspace key (or press the X button) to erase the last pressed key. When you finished entering your text, press B and the virtual keyboard will disappear. The text that you typed will be "pasted" and the emulation will go on. If you press START while in the Virtual Keyboard, you will get access to the Hint related to the current system (read the following section for more info). * The virtual keyboard don't work in a few systems: Bally Astrocade, Epoch Super Cassette Vision, or Emerson Arcadia 2001. * The ENTER key don't work in a few computer-based systems. But this is not a problem, because it is mapped to a button of the joypad (usually the left trigger). * Quotes don't work in the FM-7 and FM77-AV systems, making impossible to launch TAPE games with the Virtual Keyboard. DISKs games in these systems work though. Enter the Virtual keyboard (moving the right analog stick). While in the virtual keyboard, press START and that will activate the "hint". Exit the virtual keyboard (pressing B) and the emulator will display a hint about the command that you must use in the current system. The hint will disappear in a matter of seconds, unless you launch the virtual keyboard again. If you do so, you will be able to read the hint while you type the commands. 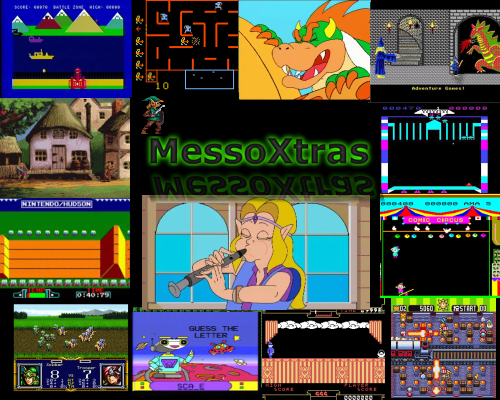 MessoXtras v0.5 supports CDi games in the "old" CHD format that was used in MESS 0.140. But if you have CHD files for MESS, they are probably in the "new" CHD format (not supported). To solve this problem, in this release we have included a script named "chd_revert" developed by Madmab, to convert files from the new CHD format to the old one, that is supported in MessoXtras. Simply copy your "new" CHD files in the same folder than the script, and launch "chd_revert.bat". The script will create CHD images in the "old" format (supported by MessoXtras) and place them in a directyory named "v140". Simply copy these generated files in the "v140" directory over to your xbox in the "roms\cdimono1" folder, and you will be able to play them. Q: Can you add more systems? A: Of course. Adding more systems is easy... but learning how to use them can be a long task. If you are interested in adding a new system to MessoXtras and want to help, contact HCF. We will need anyone to learn how that system works, mainly if it is a computer and it needs some commands to be typed to load the games. Q: Why didn't you add support to [ANY SYSTEM THAT IS ALREADY EMULATED IN XBOX]? A: It is really easy to add support to Atari 2600, Gameboy, Sega Master System... Madmab and I tried to do it, but we saw that the emulation in Mess is a bit worse than in the standalone emulators. So, we think that adding already supported systems will only add confusion. Anyways, we are open to add any system if the emulation in Mess has any big advantage over the standalone existing emulators (we don't have found this case yet). Q: The controls (for example the Start button to open the Main Menu) sometimes don't work! A: You have probably pressed the Y button, that toggles the keyboard emulation mode. When you do it, some of the main commands don't work. Press Y button again to go back to the main emulation mode. Q: How does the "Philips CDi" emulation work? A: Surprisingly, it runs at very good speed. At first it worked like a snail, but we did a very effective optimization and now it runs at full speed in Xbox. Some games don't work because some video modules of the CDi are not emulated, but a lot of the most famous games run very well. Q: How can I build valid CDi roms? A: MessoXtras v0.5 supports CDi games in the old CHD format that was used in MESS 0.140. If you have CHD files for MESS, they are probably in the NEW CHD format. in the emulator there is a folder "chd_revert" with an script developed by Madmab, to convert files from the new CHD format to the old one, that is supported in MessoXtras. Q: Parts of the top, bottom, left or right ofthe screen are cut off. A: You can adjust the screen size by pressing Start button to bring up the menu. Then select "Slider Controls". Decrease "Screen Vert Stretch" to affect top/bottom and "Screen Horiz Stretch" for right/left.